I know what you’re thinking – it’s 100 degrees outside and this crazy girl in Miami is making soup? What can I say? I love a good corn chowder and a good chowder starts with good corn. Sure, viagra frozen corn works in the winter, but fresh corn is best and the best corn of the season is just starting to show up. Since I’ve been hitting the strawberries and Nutella pretty hard lately, I wanted to keep this light. I was not kidding about my pants being too snug lately. So instead of cream and flour, I thickened the soup with skim evaporated milk and potatoes. To keep it tasty, I added some crisp and crumbled pepper bacon and ribbons of fresh basil. It’s hearty enough to be called a chowder, but light enough for summer. A happy little summer soup. Set a large pot over medium heat and add the bacon. Cook until all of the fat is rendered and the bacon turns golden and crisp, about 8 minutes. Remove the bacon to a paper towel with a slotted spatula or spoon. Leave the bacon fat in the pot. Add the onions and potatoes to the pot and cook, stirring occasionally to prevent sticking, until the onions turn translucent, about 10 – 15 minutes. Add the corn and stock and use a wooden spoon to deglaze the bottom of the pot. Let simmer for an additional 5 – 10 minutes. Remove from heat and stir in the milk. Using an immersion blender or food processor, pulse the soup a few times to thicken, but avoid making it too smooth. Return to low heat and add the salt and pepper. Taste and adjust the seasoning as needed. Ladle into bowls and top with the bacon and basil ribbons. Sometimes you just need your fix. Corn’s awesome with tarragon too! You and me both with the snug fitting pants! Thanks for a delish looking, lighter version of the classic. BTW, soup is good any time of year! I love corn chowder! And with bacon – thank you! A beautiful soup. One of my favorites. Great way to take advantage of sweet summer corn. Yum! I love corn chowder – aven in the summer – and I love that you used evaporated milk instead of cream. You may be a crazy girl in Miami, but I will soon be a crazy girl in California making this soup soon! Beautiful photos and recipe! I love soup. 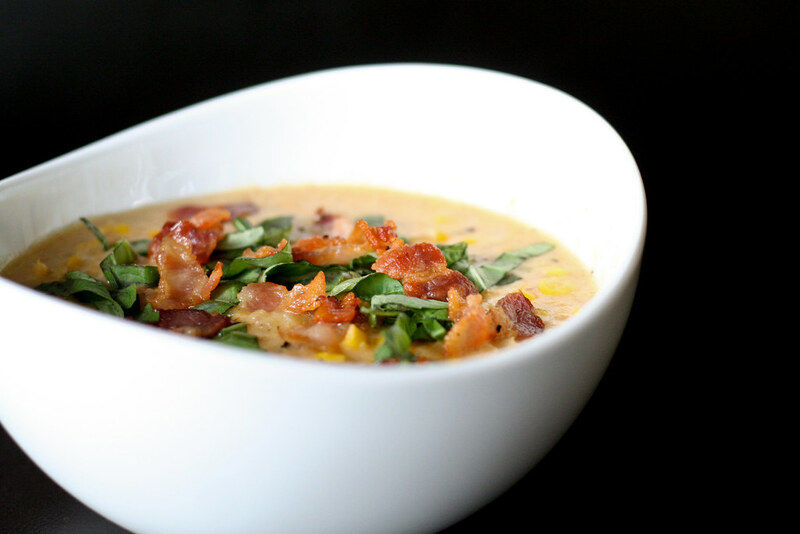 Youâ€™re Corn Chowder with Bacon and Basil looks so good. It has all things that I want in a soup. I want to cook it but the not all recipe is available in our place. Yeah, when you live in the south and it’s a hundred degrees for weeks on end, you stay inside and cook whatever you crave. 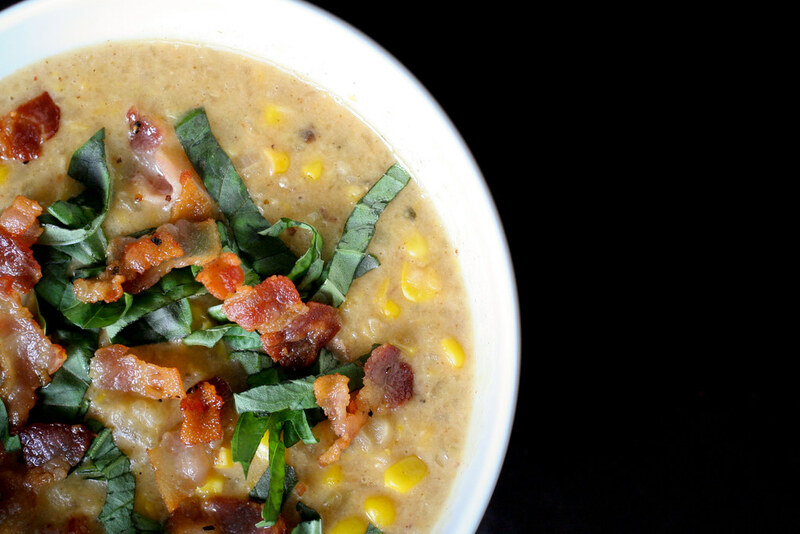 Corn chowder with fresh corn is absolutely one of my favorites. I never thought about adding fresh basil. I’ll have to try it. I’m not a hot soup on a hot day kind of girl, so I’ll keep this one in my back pocket for late August. Sounds perfect for the cool nights we get then. Just serve this on the patio with some beers and it will be plenty summery! Yum! Good excuse to make summer soup- love the idea of putting basil! Corn! Soup! Chowder! Perfect! Thank you! This is an awesome recipe, I will try it this weekend and slurp my soup ever so loudly. Gorgeous! Corn is amazing in Ontario right now; I’m going to try this out tonight. I’ve made this twice already! Yum, I love it.